The unit: Justice, her identical twin brothers Thomas and Levi, and Dorian – four children inexorably linked by their supersensory powers. How do they make their strange journeys out of the present, into a weird, barren land they call Dustland? And why are they drawn into the future on an as yet unidentified search? 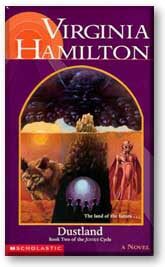 Ms. Hamilton continues the adventures of these four extraordinary children, precursors of a new race, in a totally engrossing sequel that more than lives up to the excitement and originality of Justice and Her Brothers.